"Caribbean Dream Suite." 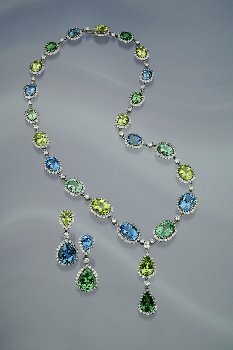 Platinum necklace and earring suite featuring Aquamarine, Tsavorite Garnet, Chrysoberyl (22.74 ctw) and Diamonds (8.41 ctw). 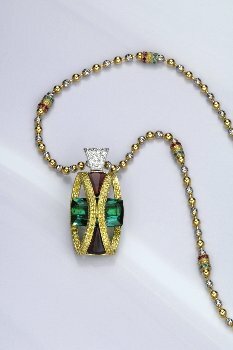 18K yellow and white gold pendant featuring an 8.80 ct. green Tourmaline, two Rhodolite Garnets (1.92 ctw), 194 yellow Diamonds (1.21 ctw), and 21 white Diamonds (0.18 ctw). The chain features 32 Tsavorite Garnets (0.22 ctw) and 32 Rubies (0.20 ctw). 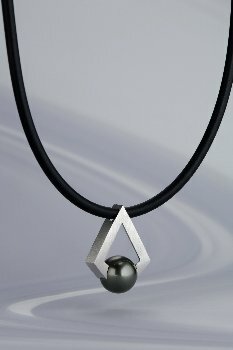 A & Z Pearls, Inc.
Rubber cord necklace featuring a 14K white gold geometrical diamond shaped pendant set with an 11-12 mm natural colored Tahitian Cultured Pearl. 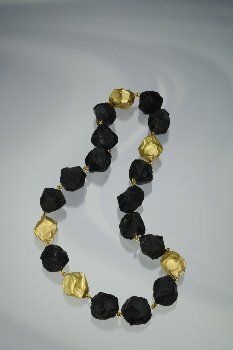 "Black and Gold" necklace featuring 22K yellow gold and hammered and chiseled black Onyx (360.0 ctw). Platinum ring featuring a 1.51 ct. Paraiba Tourmaline, six tycoon Diamonds (1.34 ctw) and 109 brilliant cut Diamonds (0.43 ctw). 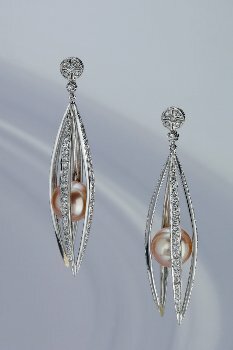 18K white gold drop earrings featuring two pink 10 mm South Sea Cultured Pearls and Diamonds (1.46 ctw). 18K white gold necklace featuring a 2.43 ct. pink Sapphire, a 1.16 ct. Alexandrite, a 0.91 ct. yellow Sapphire and Diamonds (2.94 ctw). 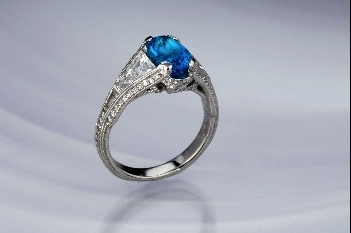 Platinum ring featuring a 5.30 ct. oval blue Sapphire and two oval brilliant cut Diamonds (1.68 ctw). 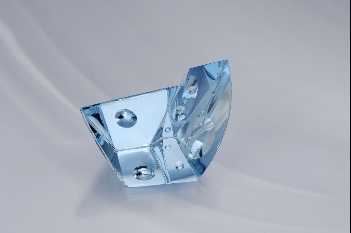 Accented with 263 brilliant cut Diamonds (1.14 ctw). 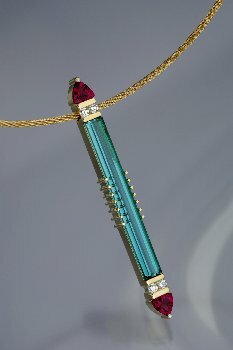 18K yellow gold pendant featuring a 10.23 ct. emerald cut Tourmaline and two trillion cut Rubellite Tourmalines (1.45 ctw). 18K yellow and white gold pendant featuring a 35.13 ct. black drusy Onyx, a 12.72 ct. bubble cut rutilated Quartz and Mandarin Garnet (7.52 ctw). 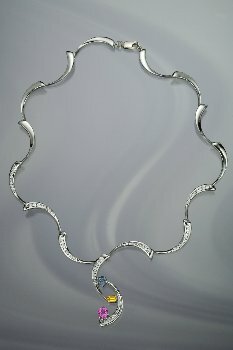 Accented with white and yellow Diamonds (1.31 ctw). 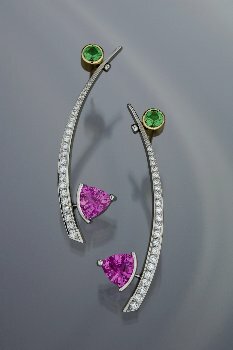 Platinum and 18K yellow gold earrings featuring two pink Sapphires (2.09 ctw), two Tsavorite Garnets (0.48 ctw) and 48 Diamonds (0.40 ctw). 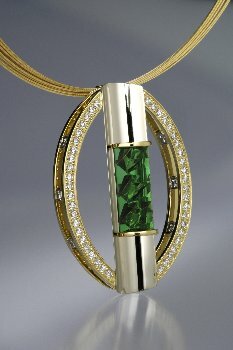 18K yellow and white gold pin/pendant featuring a 9.01 ct. green Tourmaline and 56 Diamonds (1.92 ctw). 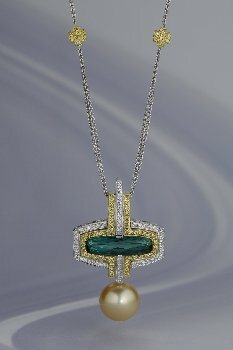 18K yellow and white gold pendant featuring an 11 mm golden Cultured Pearl, a 3.95 ct. green Tourmaline, 66 yellow Diamonds (0.52 ctw) and white Diamonds (0.40 ctw). 16" white to orange Chinese Freshwater Cultured Pearl necklace (4 mm-8.5 mm) with an 18K white gold pendant. 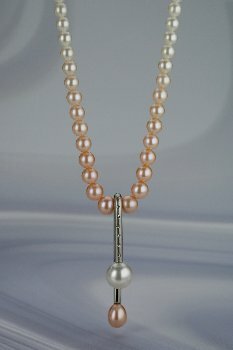 Pendant features an 8.5 mm orange Chinese Freshwater Cultured Pearl, an 11 mm white Cultured Pearl and Diamonds (.07 ctw). 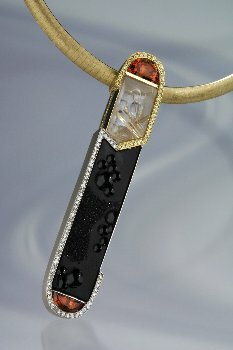 18K yellow and white gold pendant featuring a 3.70 ct. red Tourmaline and Diamonds (1.12ctw). 18K white gold "Deco Drop" necklace featuring an 18.67 ct. Peridot and Diamonds (3.56 ctw) pendant. "Grand Slalom." 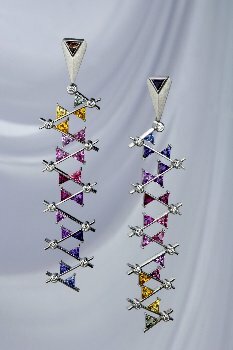 Platinum drop, hand crafted earrings featuring a rainbow suite of claw set straight-sided triangle cut Sapphires (7.00 ctw) accented with bezel set Diamonds (0.72 ctw). 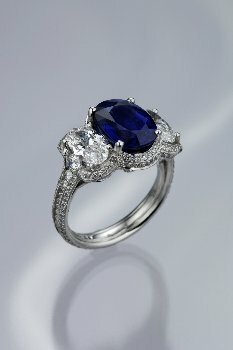 18K white gold ring featuring an 11.48 ct. Tanzanite, blue Sapphires (1.70 ctw.) 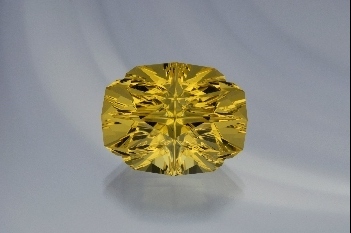 and yellow Diamonds (0.43 ctw). "Bombay Sapphire." 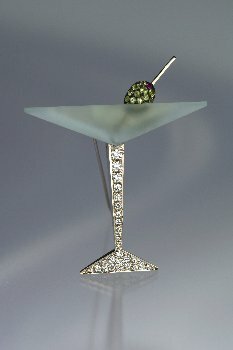 18K white and yellow gold martini pin featuring a 22.50 ct. Aquamarine, 0.14 ct. Peridot, 0.02 ct. pink Sapphire and Diamonds. 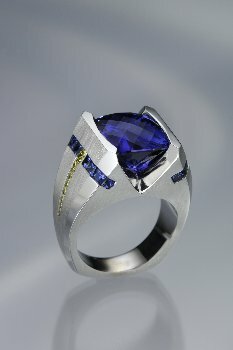 18K yellow and white gold ring featuring a 1.02 ct. Sapphire and Diamonds (0.64 ctw). 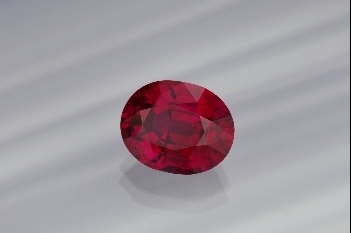 5.02 ct. oval cut Ruby. 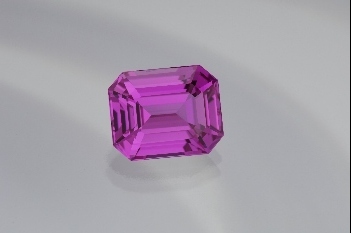 5.20 ct. emerald cut pink Sapphire. 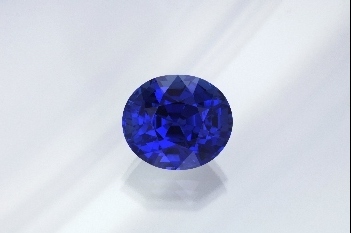 14.33 ct. oval cut blue Sapphire. 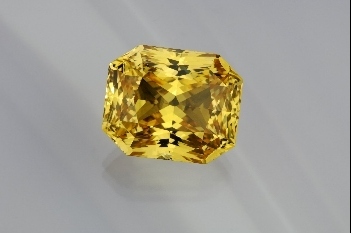 20.14 ct. emerald radiant cut yellow Sapphire. 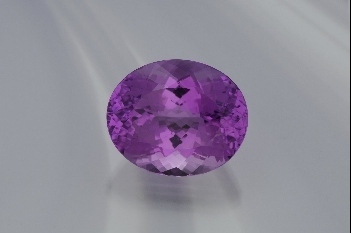 39.09 ct. oval mixed cut Kunzite. 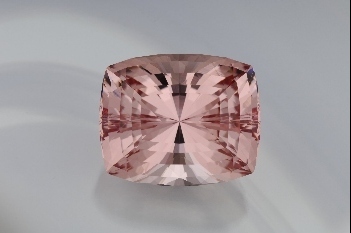 119.60 ct. fancy radiant cushion cut Morganite. 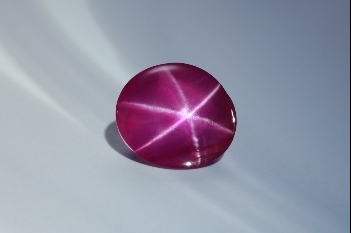 9.69 ct. trilliant cut Tourmaline. 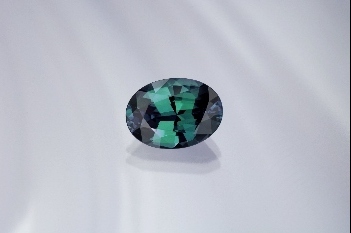 4.46 ct. oval cut Alexandrite. 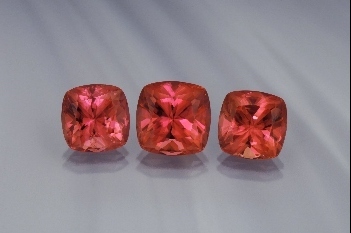 Three antique cushion cut Rhodochrosites (13.75 ctw). 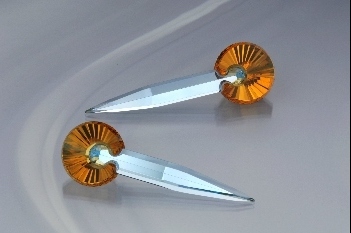 Matched pair of marquise cut red Spinels (9.75 ctw). 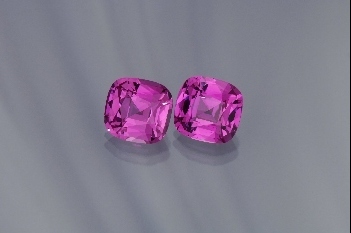 Pair of cushion cut pink Sapphires (6.69 ctw). "Angels" featuring two Aquamarines (22.0 ct. and 18.81 ct.) and two Citrines (34.07 ct. and 38.10 ct.). Aquamarine fits inside Citrine. 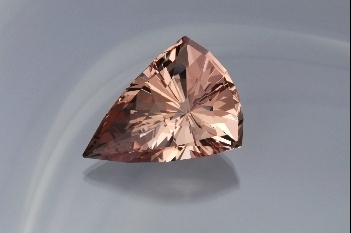 114.48 ct. long tritop trillion cut Morganite. 68.05 ct. fancy cushion cut Aquamarine. 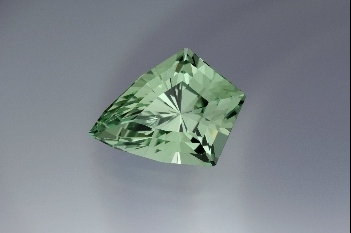 11.04 ct. modified Barion shield cut Tsavorite Garnet. 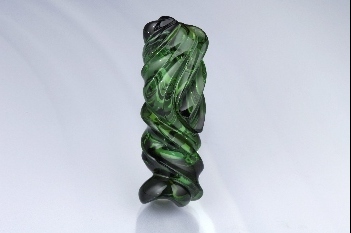 "Abstract Organic Carving" featuring a 49.72 ct. green Tourmaline. 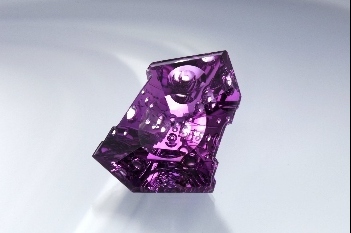 29.60 ct. tricolor Ametrine. 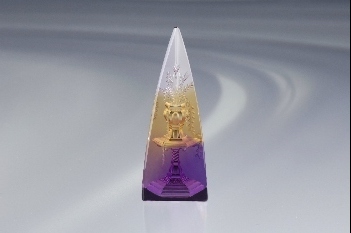 Carving creates 3-D illusion of a table, vase and flowers suspended within the gemstone. 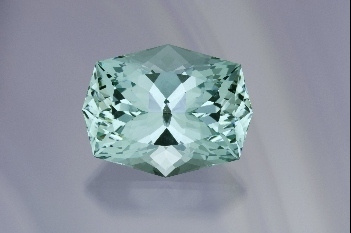 "Sea Beauty" featuring a 26.40 ct. Aquamarine. "Four Directions Oval" featuring a 26.19 ct. golden Beryl. 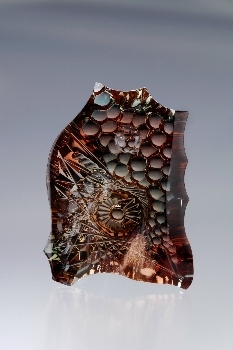 "Super Nova" featuring a 62.0 ct. free form, combination cut bicolor Sunstone. 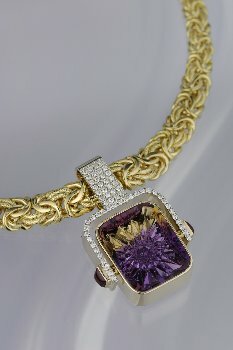 81.64 ct. hand carved and faceted Amethyst.